Similar-ish start to this second season. The live performance interrupted by the Noise attack…I’d also argue that the very first scene is similar, though I’ve concluded that it’s a scene from the past. I’m assuming it’s supposed to show the motivation for this new character Maria, who I’m also assuming is this season’s Chris. Looks like another evil scientist too…will he continue to pretend to be an ally like last season’s evil scientist? 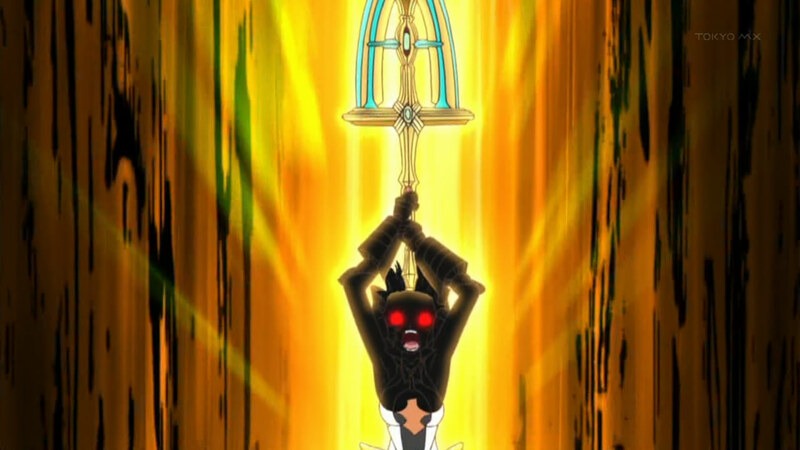 Either way, it’s a dark Gungnir…which raises some questions. Could be a piece of Gungnir that was always around and Kanade’s influence is returning…or a synthetic Gungnir (though making it black was kinda tacky, Mr. Evil Scientist). Music of this season is similar style…I only really liked one song from the first season…maybe two. After much delay, we’re finally at the final battle. 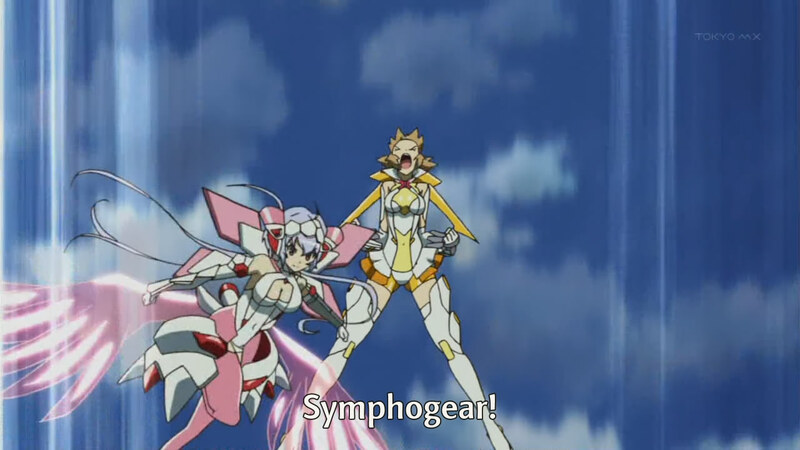 Ryouko summons a metric ton of Noise to face the reawakened Symphogear girls. While the girls take out the Noise, Ryouko fuses herself with another relic, taking Durandal and absorbing the Noise to become a more powerful, giant Noise enemy. 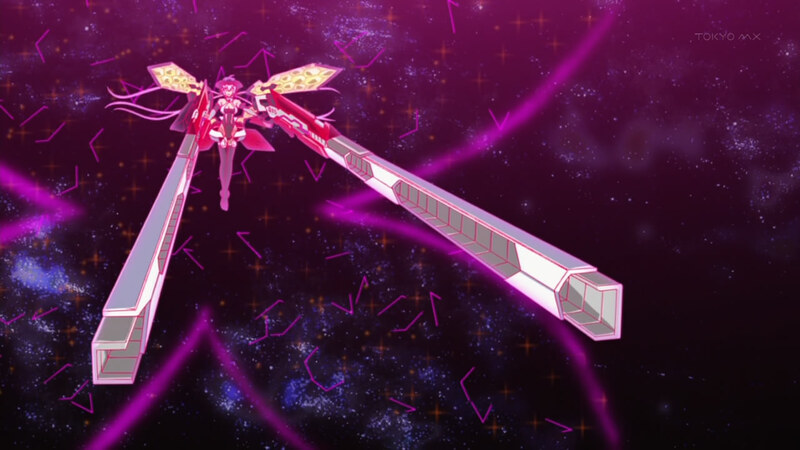 Chris creates an opening so that Tsubasa can pass Durandal to Hibiki. Hibiki goes feral again, but everyone leaves the bunker to support her. She manages to regain control and uses Durandal to cut down Ryouko, but doesn’t kill her. However, Ryouko uses the last of her power to drag the broken part of the Moon and send it plummeting towards Earth. 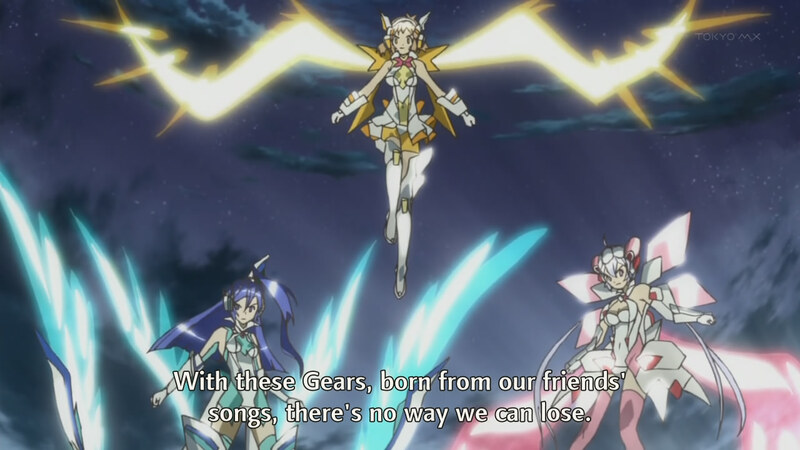 Hibiki prepares to sing her swan song to save everyone, but Chris and Tsubasa join her. Together, they sing a swan song to destroy the fragment. Weeks later, the three have been declared dead. Miku goes to visit Hibiki’s grave and a nearby woman is attacked by Noise. Miku tries to protect her, and is saved by the three girls, whose survival was classified. A very enjoyable series and solid ending. Naturally, I’m glad that Chris survived in the end. Going into this episode, I was pretty sure that everyone would survive in the end, and while I doubted myself a couple of times, I was sure when Miku mentioned the deaths being classified. As a whole, some of the parts in the show seemed a bit rushed and maybe a bit predictable, but I still thought everything was good. This week, there were a couple of insert songs with all three of the girls singing and they both sounded pretty nice. Part of me thought that the first one was a bit too light for a battle situation, but it still seemed okay while I was watching. I find it hard to say what I thought of all of the music in the show. The premise revolves around music, so the bar is set a bit high…I’ll have to think about it. But still, it has been fun to blog this show…which I still think is Power Rangers with girls. As expected, Hibiki goes berserk again in response to Chris’s sacrifice. As Ryouko planned, the power of the relic fragments is overpowering Hibiki’s humanity. Ryouko also prepares to fire Kadingir again. Tsubasa allows herself to be hit to immobilize Hibiki, then faces off against Ryouko to stop Kadingir, sacrificing herself to destroy it. 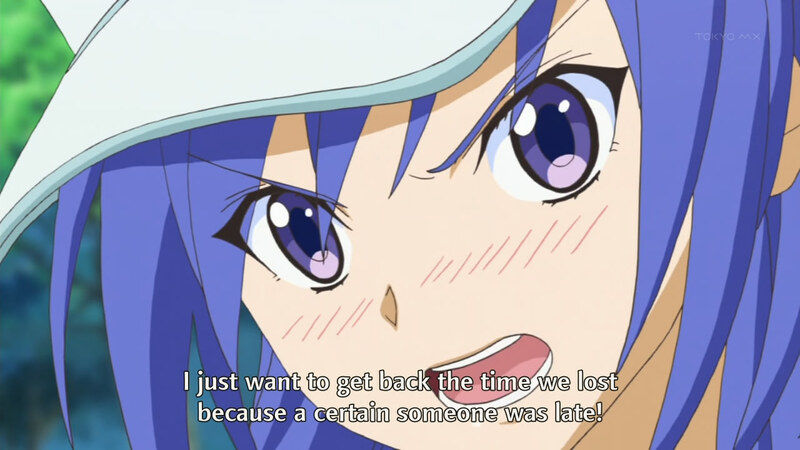 Hibiki returns to normal, and is left alone to face Ryouko. Miku reactivates the school’s power with Hibiki’s friends and uses it to encourage Hibiki. Hibiki, Tsubasa, and Chris all stand up again to face Ryouko as the episode ends. So to get this out of the way, I’ll start with: CHRIS IS ALIVE! WOOT! With that aside, that last scene was pretty cheesy…with everyone singing to revive the three heroes. Still, I can understand why the show chose that direction. Also, what is up with the power system of the school being a light switch? That’s pretty lame >.> But I can get past that…Lots of sacrifice going on, but in the end, everyone comes back because this show is basically Power Rangers. I was kinda hoping that things would go a more interesting direction when Tsubasa sacrificed herself, but I’m glad no one died. Specifically, I was hoping it wouldn’t simply be Ryouko as the big bad that they have to face. That looks like it’s the case, though…seems like a pretty simplistic way to end, but I guess it’s okay. Next week, everything will be wrapped up…guess we’ll also see what’s up with Hibiki’s death. Picking up from last week, Miku is trying to evacuate everyone from the school during the Noise attack. Ogawa tries to tell Genjurou the true identity of Kadingir, but Fine arrives to interrupt him. Ogawa reveals that the elevator shaft to the base is the actual Kadingir, and the only one who could create it is Ryouko/Fine. Genjurou arrives to face off against Ryouko, beating the crap out of her, but she is able to stab him by acting innocent for a second. 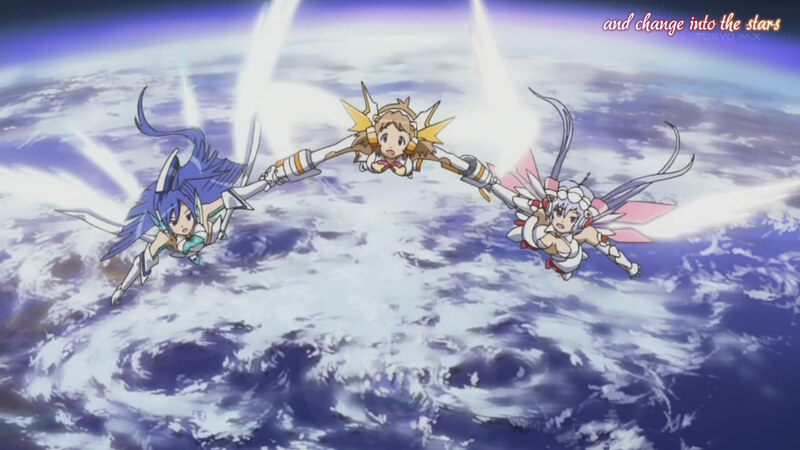 Hibiki, Tsubasa, and Chris arrive to face Ryouko as she activates Kadingir, planning to shoot the Moon. Chris uses a missile to launch herself above the cannon, then uses her swan song to block the shot so that only part of the Moon is damaged. So…if Chris dies, this show is uncool. I may actually rage. Still, I can sorta understand why they did it. With two episodes left, they need something to happen. And I assume that her sacrifice will cause Hibiki to fly into a rage and go feral again…maybe even force everyone to fight her, leading to her eventual death as predicted in the first episode. On another note, I figured there was more to Ryouko than simply being evil. Although Ryouko was evil during the course of the series, she was taken over by Fine, not evil all along. Also, I never noticed it until all three of the girls sang, but their songs sound like continuations of each other. I dunno whether that’s intentional, but it’s still cool. Let’s see how my predictions hold up next week. This week’s episode starts off with Ryouko being ambushed, but she kills her pursuers. Chris shows up to investigate after she has left, followed quickly by Genjurou. After Genjurou saves Chris from a booby trap, she finally listens to him and starts to trust him telling him about Kadingir. Genjurou tries to find out more about Kadingir, but is interruped by a Noise attack. When the Noise all converge on Tokyo Sky Tower, everyone concludes that it must be related to Kadingir. Tsubasa and Hibiki are at a disadvantage, but Chris shows up to help. Together, they wipe out all of the Noise, but the episode ends with the school being attacked by the Noise while they’re all distracted. Jeez Chris…you finally join everyone. It’s about time. Seriously…I’m pretty sure Chris has like the best relic and the best songs. Can’t be using that for evil, can you? 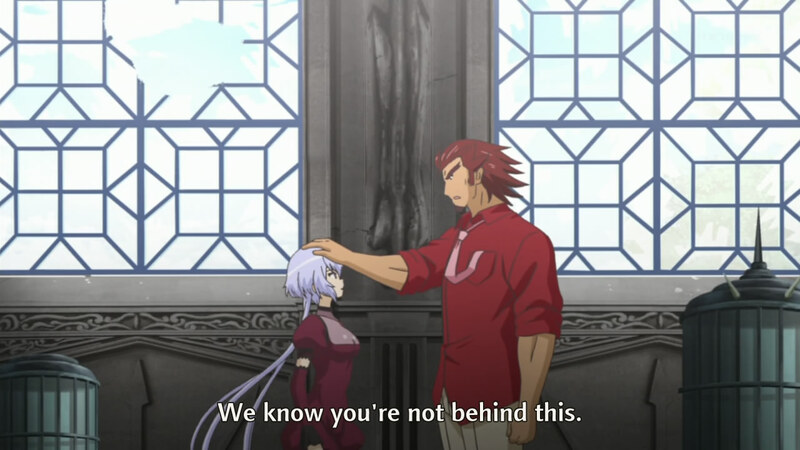 Anyways, all signs point to Ryouko being evil…especially that line from Genjurou. Still, there’s a very small possibility that she isn’t, so I can’t condemn her yet (that will probably change next week, though). It was pretty obvious to me (and probably Genjurou too) that the Tokyo Tower thing was a diversion. It was way too convenient to be Kadingir. We’re getting pretty close to the end, which means Hibiki will probably die. Based on what I’ve seen so far, it will likely be in an effort to protect Miku, but we’ll just have to see. This week’s episode starts off with Tsubasa back in action and Miku joining up with everyone. Meanwhile, Genjurou finds Chris and reveals a bit of her past: she’s the daughter of two musicians who were killed while trying to help some refugees. Genjurou reveals that he was going to be the one in charge of taking care of Chris, but she went missing. Chris is still unable to trust him, though, and runs away. Tsubasa, Hibiki, and Miku all spend the next day together. 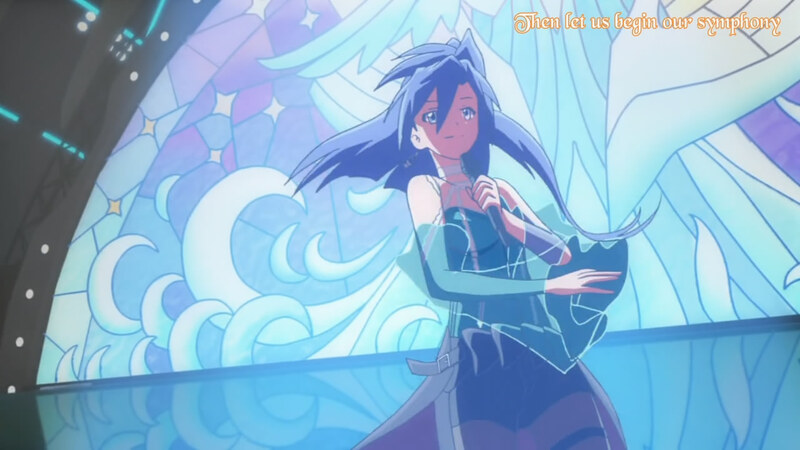 Tsubasa starts to perform again, inviting Hibiki to a show, but the Noise appear as the show starts. Hibiki rushes to take care of them to allow Tsubasa to perform and runs into Chris, who is also fighting. After her performance, Tsubasa announces her intention to go overseas to sing. An injured Chris is found by none other than Miku at the start of this week’s episode. Miku helps nurse Chris back to health, trying to befriend her, but they are interrupted by a Noise attack. Tsubasa isn’t cleared to fight, so Hibiki goes out by herself. Chris faces off against the Noise herself, while Hibiki finds Miku, who has been attacked by a different Noise. The two make up and Miku draws the Noise while Hibiki defeats it. As expected, Chris is on her way to becoming part of the team. She’s probably a better character than Tsubasa is (I still don’t like how easily she came to terms with Kanade’s death). Also, her fight scene was probably better than any of Tsubasa’s. Genjurou has a weird line with Chris about not being able to save her. It seems kinda important…what does he know? 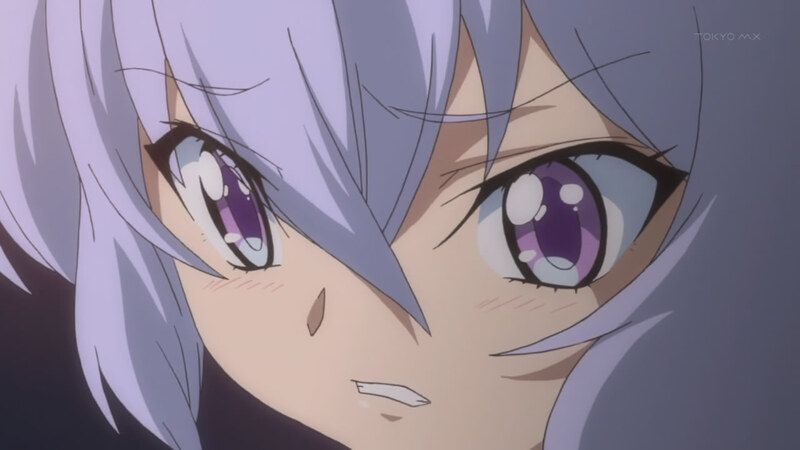 Also, I guess Miku will try to help out more, but I wonder what she’ll be able to do without Symphogear. There’s only so much. The battle from last week continues. Hibiki continues with her friendship approach, but Chris uses a different relic called Ichii-Bal. 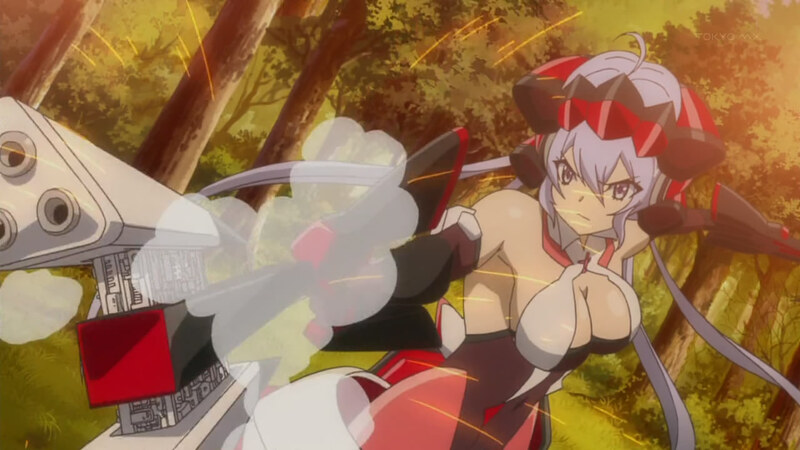 Hibiki is defended by Tsubasa, who arrives on the scene. 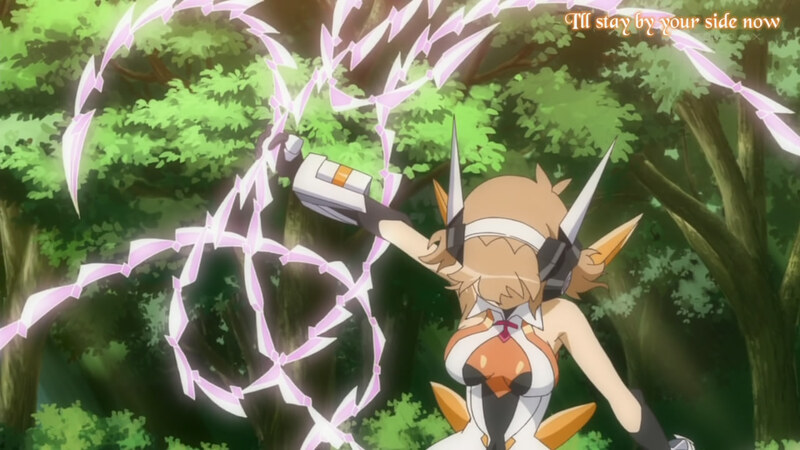 They are attacked by Noise during the battle, and Hibiki takes an attack for Chris. We are introduced to Fine, the blond woman from before, who ends up rejecting Chris. With the battle over, Miku gets angry at Hibiki for keeping everything from her. Meanwhile, Chris finds a couple of kids who have been separated from their father and reunites them. Miku tells Hibiki that the two can no longer be friends. The episode ends with Fine completing Kadingil and preparing to kill Chris. I feel like a lot of these things are things I’ve seen before. Tsubasa accepted Kanade’s death, so she’s able to fight without reserve and gets stronger. Hibiki took the attack for Chris and Chris was rejected by the bad guys, so she will join up with everyone. More than likely, Chris will get stronger and then the bad guys will convince her to help them again, but she’ll be brought back by Hibiki. 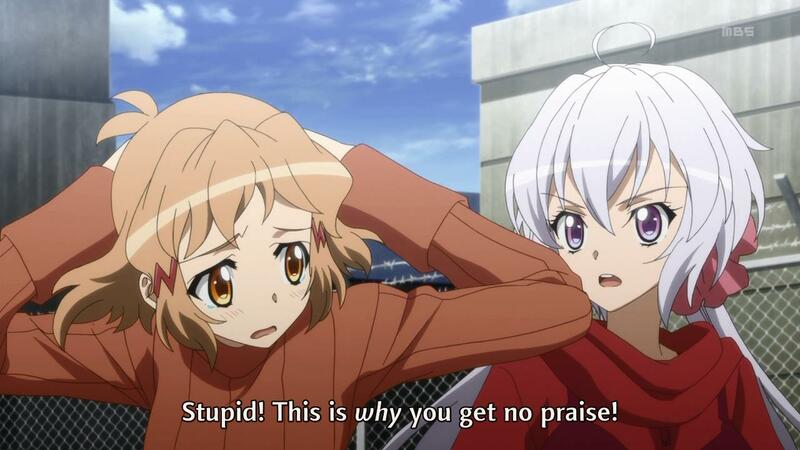 The stuff Ryouko was saying about the Symphogear was kinda cool, though. I swear I’m watching Power Rangers in anime form >.> I expect Chris to join the good guys next week…she seems to be on her way. So this week’s episode starts off with more time with Chris, who is jealous of Hibiki’s power. Meanwhile, Genjurou talks about how the minister’s death last week benefit HQ, allowing them to upgrade their defenses. Hibiki goes to visit Tsubasa, who is suddenly not as cold towards her. Miku also sees the two of them talking together. 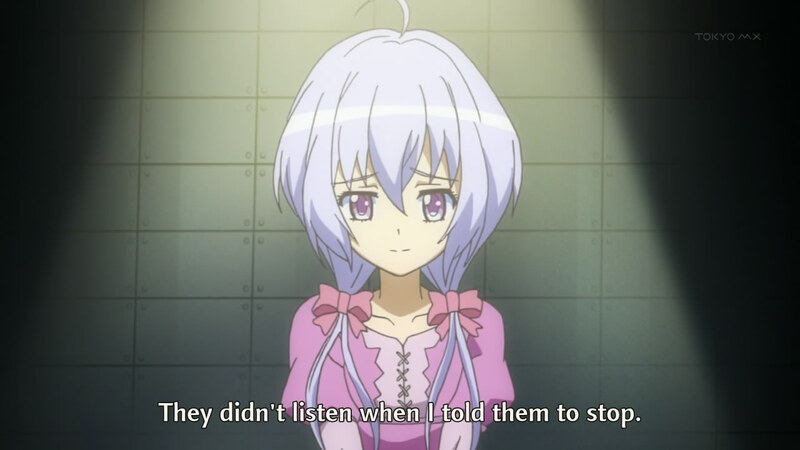 Tsubasa asks Hibiki why she fights, and she responds that she just wants to help people, and part of it comes from Kanade’s death. Chris attacks a park and Miku is almost caught up in it, but Hibiki defends her, revealing her Symphogear armor to Miku. Rather than fight, Hibiki tries to talk to Chris, but she refuses to listen. Hibiki then beats the crap out of Chris. So I guess because Hibiki can’t materialize a weapon, she’s going to just use her fists from now on. It’s kind of boring, but if that’s how it is, that’s how it is. 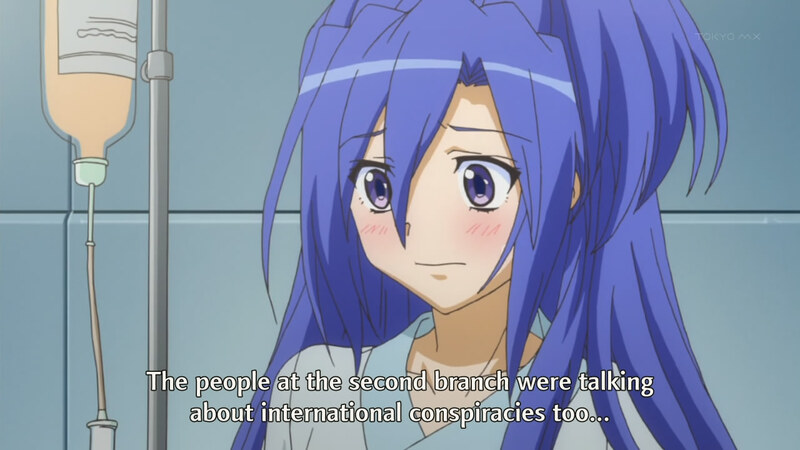 Tsubasa seems to have dispelled all hate for Hibiki, so I guess she accepted Kanade’s death last week. It’s a bit sudden for my taste and almost unprecedented, but I guess I can roll with it. It was inevitable that she would break out of that cold attitude eventually. Looks like Miku is getting roped into all of this now. Her role just got a bit more important now that she’s discovered the big secret. Also, Hibiki’s reasons for fighting seem standard for this type of show. Honestly, that conversation seemed a bit repetitive to me, with Hibiki just going on about helping people, but it works. Next week, Miku will be filled in and I wonder if Tsubasa will be able to fight again. Random Engrish aside, the girl from the last episode is introduced as Chris, and she endures torture to fulfill her wish. Meanwhile, Hibiki continues to train while Tsubasa recovers. Things get serious when the minister that Ryouko meets is assassinated. However, Ryouko ends up with the briefcase that was stolen from him (suspicious!). The suitcase contains information about a scheduled transport of Durandal. Hibiki moves out with Ryouko to help keep Durandal safe in transit. However, they are ambushed by the Noise and Chris. Hibiki starts to fight, and Durandal reacts to her and activates. When she grabs it, she turns feral once again and obliterates the Noise. So a couple of interesting things to note. 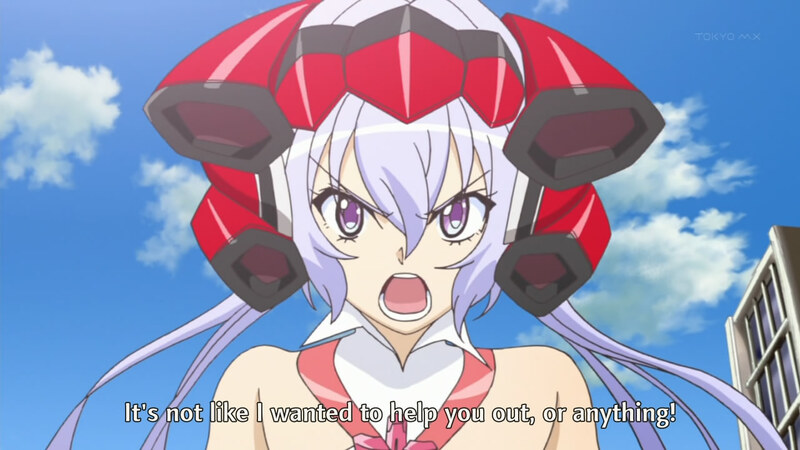 First off, either Ryouko is evil or she’s one of those characters that wants to see the technology of Symphogear advance so much that she acts crazy to make it happen. Second, Chris might end up being an ally in the future…her link to the dark side doesn’t seem so strong. She could easily be swayed by some nice words. From the scenes, it looked like Tsubasa finally reconciled with Kanade’s death, but we’ll have to wait and find out if that’s really the case. It seems kinda early for her to suddenly become all mushy. Wonder if she’ll be okay with Hibiki next week, especially now that she has Durandal.